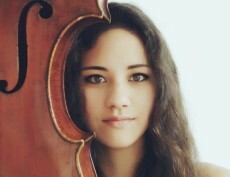 Born Japan, Riana Anthony began playing cello at age nine and was awarded two prizes in the Osaka Izuminomori Festival in two years. In Honolulu from 2003, she made her Honolulu Symphony debut at age twelve. She has performed with the Maui Youth Philharmonic and Shanghai City Symphony Orchestra and won prizes in Asian and North American competitions. Twice a fellowship recipient at the Aspen Music Festival, she has participated in the Moritzburg Festival, Meadowmount School of Music, and Amelia Chamber Music Festival. A student at the McDuffie Center for Strings, she returns to Rome for a third time.